}}: القاهرة الكبرى‎ al-qāhira al-kubrā) is the largest largest urban area in the Islamic World after Jakarta and Karachi, and the world's 16th largest metropolitan area, consisting of Cairo Governorate, Giza city, Shubra El-Kheima, 6th of October City and Obour City, with a total population estimated at 20,500,000 (as of 2012); area: 1,709 km2; density: 10,400/km2. 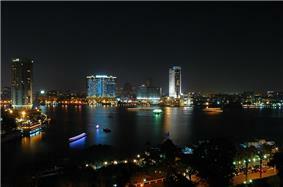 Greater Cairo and the surrounding area have a hot desert climate (BWh) in Köppen-Geiger classification, as all of Egypt. Cairo and its surrounding region have very similar day to day temperatures; however, the less populated parts at the east and the west do not have the urban heat, which makes them more prone to have ground frost and soft hail.